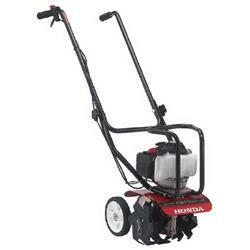 Small Honda 1.5 hp mini-tiller/cultivator. 9" tilling width - weighs 34 lbs. For soft or mildly compacted soil only. Ideal for cultivating between garden rows, etc. Great for a variety of gardening jobs. * Please call us with any questions about our tiller 1.5 hp mini honda rentals in Oak Grove MO, Blue Springs MO, Independence MO, Lexington MO, Odessa MO, Independence MO and Western Missouri.